Over 1300 Duelists have been reduced to just 16! 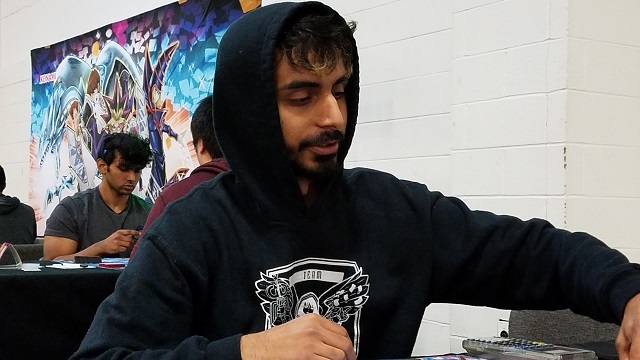 Manav Dawar is here all the way from Seattle, piloting a Sky Striker Deck. He’s one of the few Duelists to stick with a pure build, instead of mixing it with Trickstars. His opponent is Matthew Vanden Heuvel, from Toronto, who wrestled his way here with Gouki. Dawar won the die roll and chose to play first. He had a hand of Ash Blossom & Joyous Spring, Sky Striker Airspace – Area Zero, Sky Striker Mecha – Widow Anchor, Sky Striker Mecha – Hornet Drones, and Ghost Reaper & Winter Cherries. He played Hornet Drones and Link Summoned Sky Striker Ace – Kagari, getting Hornet Drones back to his hand. He played Area Zero and Set Hornet Drones. He used Area Zero, adding Sky Striker Mobilize – Engage! to his hand and sending Hornet Drones to the Graveyard. He activated Engage, getting Sky Striker Mecha Modules – Multirole, and activated it. 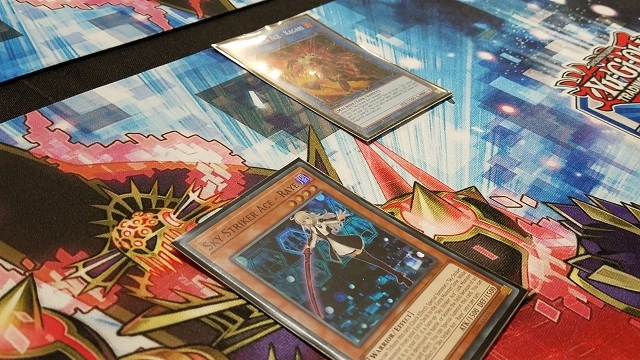 He used Kagari to play Sky Striker Ace – Shizuku, then Set Widow Anchor. In the End Phase, Shizuku added another Widow Anchor to his hand. Vanden Heuvel played Reinforcement of the Army first, and Dawar negated it with Ash Blossom. Vanden Heuvel followed up with Marauding Captain, but Dawar flipped Widow Anchor to negate it. Vanden Heuvel pressed on, now with Instant Fusion! He Fusion Summoned Dragoness the Wicked Knight, and Dawar used Ghost Reaper & Winter Cherries! Both players banished all their copies of Isolde, Two Tales of the Noble Knights! Vanden Heuvel was forced to go for a different play, and Xyz Summoned M-X-Saber Invoker. He used it to Special Summon Gouki Suprex, then used both monsters to play Knightmare Phoenix. He discarded another Gouki Suprex to destroy Multirole, and his first Suprex added Gouki Twistcobra to his hand. He used his Phoenix to play Knightmare Mermaid, then activated Left Arm Offering! He banished his hand to search out Soul Charge! He played it to revive all the monsters in his Graveyard, dropping to just 2000 Life Points! He used two of them to play Knightmare Goblin, then his others with Mermaid to play Knightmare Unicorn. He ended his turn with Phoenix, Goblin, and Unicorn, in that order in his Main Monster Zones. What a Knightmare for Dawar! Dawar drew Ash Blossom. He had Ash and Widow Anchor in his hand, with Shizuku and Area Zero on the field. He used Shizuku to play Kagari, getting Engage to his hand. He activated Engage, searching out Sky Striker Maneuver – Afterburners! and drawing Solemn Strike. He had intended to use Afterburners to destroy a Knightmare, but misunderstood which effects were in play. Since Goblin was protecting them, he wouldn’t be able to use Afterburners on any of them. (After he realized the mistake, he noted that he could have gotten Sky Striker Maneuver – Jamming Waves! to destroy a monster without targeting.) He Set Afterburners and Widow Anchor, and used Area Zero on the useless Widow Anchor. He was able to add another Widow Anchor to his hand with Area Zero – not much help. He used Kagari to Link Summon Shizuku. He went to the Battle Phase and attacked Goblin (which wasn’t destroyed thanks to Phoenix), dropping Vanden Heuvel to just 1300 Life Points. Dawar Set Widow Anchor and Solemn Strike. In the End Phase, Shizuku added Sky Striker Maneuver – Jamming Waves! to his hand. Vanden Heuvel drew three cards thanks to Unicorn! He played Twistcobra, using Unicorn and Twistcobra to play Firewall Dragon – Dawar flipped Solemn Strike. Twistcobra’s activated, but Dawar negated it with Ash Blossom. Vanden Heuvel played Gouki Re-Match, bringing Twistcobra and Suprex to the field. He used Suprex with Phoenix to play another Phoenix – it discarded Gouki Riscorpio, targeting Widow Anchor, and Suprex activated. Dawar Chained the Widow Anchor to steal Twistcobra, and Vanden Heuvel added Gouki Headbatt to his hand. He passed his turn. Dawar drew Shared Ride. He used Shizuku to play Kagari, and added Engage to his hand. That let him search out Hornet Drones and draw Ghost Ogre & Snow Rabbit – Vanden Heuvel used Droll & Lock Bird after it resolved. Dawar Set Hornet Drones and used Jamming Waves to destroy Hornet Drones and Phoenix. Now that Goblin was left alone, Dawar flipped Afterburners to destroy it and Area Zero. He Special Summoned Sky Striker Ace – Raye with Area Zero, and moved to the Battle Phase to end the first Duel! Vanden Heuvel simply passed his first turn. Dawar had Ghost Reaper, 2 Hornet Drones, Multirole, Widow Anchor, and Darkest Diabolos, Lord of the Lair. He played Multirole, then Hornet Drones, and Link Summoned Kagari to get Hornet Drones back. He attacked directly, then Link Summoned Shizuku. He Set Widow Anchor and Hornet Drones, and Shizuku added Engage to his hand. Vanden Heuvel Set two in his back row. Dawar drew Infinite Impermanence. He used Multirole targeting his Hornet Drones, and didn’t Chain it. He played Engage, getting Area Zero. Vanden Heuvel flipped Shared Ride at this point – he couldn’t before due to Multirole. Dawar Set Infinite Impermanence. In the End Phase, Multirole Set Hornet Drones on the field. Dawar drew Ghost Ogre & Snow Rabbit. He used Multirole, targeting Hornet Drones, and Chained it to get a Sky Striker Ace Token. He played Area Zero, using its effect to add another Multirole to his hand and send his Widow Anchor to the Graveyard. Vanden Heuvel activated Droll & Lock Bird, trying to just survive. Dawar Tributed Shizuku to play Darkest Diabolos and attacked directly, then Tributed it to rob Vanden Heuvel of a card from his hand. Dawar Set Hornet Drones, and used Multirole to Set Widow Anchor. Vanden Heuvel finally played a monster, Marauding Captain, and its effect was negated by Widow Anchor. Vanden Heuvel Chained Blue Mountain Butterspy, and Dawar used Ghost Reaper to banish Isolde just like in the last game. Vanden Heuvel played Instant Fusion to play Dragoness, combining it with Captain for M-X-Saber Invoker. He used its effect, and Dawar flipped Infinite Impermanence to negate it, along with the Set card in Vanden Heuvel’s back row. 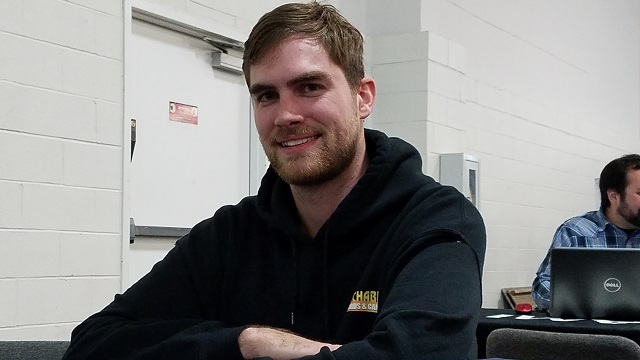 Vanden Heuvel played Monster Reborn to bring Darkest Diabolos to his side of the field. He attacked with Invoker and Diabolos, putting the score at 1000 to 3400, with Dawar leading. In Main Phase 2, Vanden Heuvel used Blue Mountain Butterspy and M-X-Saber Invoker to play Knightmare Phoenix. Dawar used Multirole to get Engage on the field in the End Phase. Dawar began taking his next turn, but the round timer ended in his Main Phase 1. As he was ahead in Life Points, he was declared the winner of the Duel and the Match! Manav Dawar is going to the Top 8 with Sky Strikers! Sunday’s Top 4 Generation Duelists! Sunday’s Top 4 Dragon Duelists at YCS Secaucus!